If You Only Live Once sounds like a prequel to a famous James Bond movie then you're probably not a fan of classic film noir. If you are then you'll doubtless be pleased to learn that gripping 1937 crime drama is coming to UK DVD in June, and, rather unexpectedly, with a couple of interesting extra features. Eddie Taylor (Fonda) is an ex-convict who can't get a break on the "outside". He marries Joan Graham (Sidney) who like her husband is one of life's losers. Framed on a murder rap, he is forced on the run with his wife and baby in tow. In trying to avoid capture, Taylor becomes a murderer for real. Partly based on the legend of Bonnie and Clyde, You Only Live Once is an early film noir classic, directed by Fritz Lang (Metropolis, Dr. Mabuse, der Spieler, M... oh you know all this) – his second American film – and starring the fabulous Henry Fonda (Grapes of Wrath, Twelve Angry Men... again, this should be redundant) and Sylvia Sydney (Fritz Lang's Fury, Blood On The Run). It was described by Dennis Schwartz over at Ozu's World as "An emotionally draining but superb visually told moralistic Depression-era film noir directed by Fritz Lang that smacks of fatalism, a dark German expressionist style, and a Bonnie and Clyde scenario." Nice. 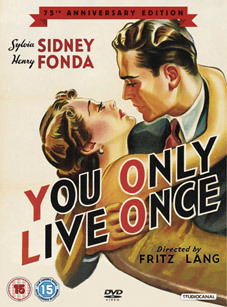 You Only Live Once will be released on UK DVD by StudioCanal on 4th June 2012 as a 75th Anniversary Edition at the RRP of £19.99. Inside You Only Live Once, production takes from a film in the making.